On paper, it looks grand from every angle. A herd of goats descends on a neglected field, overgrown with invasive plants inflicting damage on native ecosystems. They eat the plants, fertilize the land, and move on. But for the farmers who rent out these herds of goats? The business model is another story. The goats browse away happily, completely defoliating these unwanted plants. They destroy the seeds inside their digestive tracts and then scatter droppings everywhere, fertilizing the ground as they go. They come back another time or two for subsequent passes, and voilÁ , a piece of land overrun by invasive plants has been reclaimed and improved in a cute, non-chemical and non-fossil fuel-burning way. Thus has the goat rental business taken hold across the country. 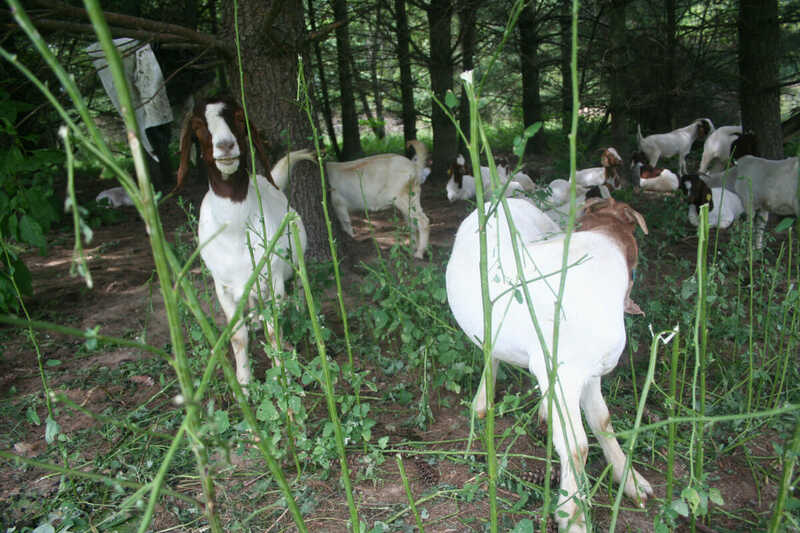 Landowners with an invasive plant problem call up the goat rental place, the goat rental place puts up fences and turns its herd loose, the herd goes to work, the goat rental company sends an invoice and moves on to the next job. Largely due to the goats’ inherent appeal, this sort of thing attracts plenty of attention. In early August, when Eco-Goats put its herd out on the Congressional Cemetery in Washington, D.C., the media had great fun with the idea of goats helping clear the graves of J. Edgar Hoover and 90 former members of Congress. The Annapolis-based company specializes in small “boutique-y” jobs (three acres is big) in the greater Baltimore-Washington area, says supervising forester Brian Knox. Often, Eco-Goats has its herds out on public green spaces for homeowner associations, municipalities and schools, with rates starting at $350 per day for a herd of about 30 goats. In suburban Maryland, there’s no shortage of demand at this price point; Knox’s calendar through a significant part of next summer is already filled. But while a homeowners association near Washington may well be inclined to spend four figures on a safe and enjoyable solution to a poison ivy problem in its park, a landowner looking for a direct return on investment faces a very different set of considerations. “From a farmer’s standpoint, we’re ridiculously expensive,” says Knox. That’s a challenge facing Clay Trainum of Autumn Olive Farms in Virginia’s heavily farmed Shenandoah Valley. He has to charge farmers at least $1,200 per acre for three successive visits from his goats over about a year’s time (repeated browsing is necessary to truly kill back well-established invasive plants). But farmers who need to keep per-acre inputs (like rental goats) below per-acre income have a difficult time making it pencil out. Much further west, near Boise, Tim Linquist has encountered the same issue with his company, We Rent Goats. “It’s really tough to go talk to a cattleman and say, ‘Hey, we’ll put these goats out on your place.’ That’s a heck of a sale,” says Linquist. Instead, much of Linquist’s business comes from public agencies like county road departments, which have land to keep clear but don’t care about earning a return on every acre of median and roadside. He also frequently works with land management agencies tasked with fire prevention. Invasive cheatgrass and medusahead make excellent kindling, and since his goats are happy to eat these away, fire prevention agencies are happy to keep his goats employed (less fire-prone native plants are planted behind the goats). Another piece of the business puzzle for Linquist in the wide-open West involves lifestyle choices. Moving from job to far-flung job requires a lot of travel, so he’s adopted a nomadic routine, staying with his goats wherever they happen to be working. Back in Virginia, the production agriculture customer base surrounding Trainum has prompted him to begin shifting a sort of barter system, trading his goats’ invasive plant control services for free forage. That’s an economically viable approach if the goats are bred and managed for efficient meat production, and if the investment in fuel, labor and time of moving the goats from job to job is still less than it would be to get feed some other way. That input-vs.-income thing? Goat rental outfits face this same issue too. The goat meat market is an important variable in this goat rental business. Goats can thrive on an invasive plant diet, and meat goat production is one of the fastest-growing segments of American livestock production. Eventual sale of the rental goats raised on invasive plants, whether procured for hire or simple barter, is part of how Trainum and Linquist turn a profit with rental goats (Linquist does finish his meat goats for a period of weeks on alfalfa hay before selling them). In Maryland, however, Knox finds it better to not sell his goats for meat. His customers tend to get attached to individual goats and don’t prefer to think about them eventually becoming goat curry. Consumer preference dictates yet another approach for Lynette Nadeau of Goat Peak Ranch in Red Wing, Minn. She sells her meat to high-end markets, and while she puts her nannies out on invasive plant jobs, she keeps their kids on her own farm where she can carefully control their feed and meat quality. As is the case for anyone who earns a living with livestock, all sorts of circumstances beyond individual control can cause serious problems. In Minnesota, where a tough, long winter wiped out much of this year’s hay crop, Nadeau has found herself in trouble. Feeding her on-farm meat goats has come with an exorbitant bill thanks to the hay issue, and she’s simply trying to keep her company afloat. Still, she’s already reduced her herd from 700 goats to just 400, and Nadeau is unsure whether she’ll still be in the goat business at all by the end of the year. No one disputes the greatness of the goat in the battle against invasive plants. How to harness that greatness into a viable business model, though, remains far less settled.